DC power distribution is mission critical. Your dc powered equipment sometimes "locks-up," often requiring a service call to flip the power switch to perform a simple reboot. The RPC-40L8A4 gives you the ability to remote reboot and remote power cycle your DC equipment from anywhere; just point your browser to the IP address of any RPC-40L8A4 unit, enter the secure user name and password, and you're a click away from remote dc power management! 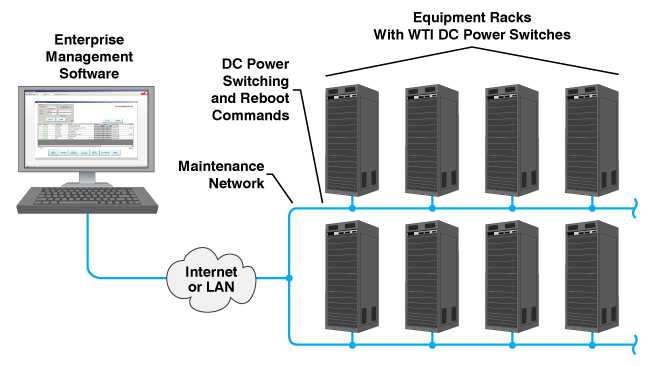 The RPC-40L8A4 can be configured via SSH or SNMP, or locally via the serial console port. Easy to master, user-friendly menus and commands allow you to assign a location name, set system parameters and view On/Off status. Terminals can be switched on, off, rebooted or set to user-defined default status using terminal numbers or names. In addition to performing scheduled reboots and power switching in dc environments, the RPC-40L8A4 also includes an assortment of administrator-defined alarm features, which can be used to automatically reboot or switch terminals when high rack temperatures, open circuit breakers, power supply irregularities, unresponsive network elements and other important events and factors are detected. When any of these alarm functions are triggered, the RPC-40L8A4 can also provide notification via email, SNMP or SYSLOG message. Each alarm includes a configuration menu that can be used to customize alarm triggers and response actions to fit the requirements of your specific application. The RPC-40L8A4 is built with (4) alarm inputs from dry contacts for automated notification and power control based on conditions in your rack or cabinet. This allows the RPC-40L8A4 to detect dry contact closures and initiate notification via SNMP, SYSLOG or email. If further action is needed when sensing a dry contact alarm the RPC-40L8A4 can automatically turn On/Off/Reboot specified DC equipment. Access to the RPC-40L8A4 command mode is password protected to prevent unauthorized users from invoking sensitive switching and configuration functions. Both the Web Browser Interface and Command Line Interface require the user to enter a password and username before allowing access. The RPC-40L8A4 also features four different levels of user accounts; Administrator Level, Super User Level, User Level and View Only Level. Administrators are allowed access to all configuration and operational commands. Super Users are allowed to direct switching commands to any terminal and can view configuration menus, but are not allowed to change configuration parameters. User accounts are allowed to invoke switching commands, but are limited to the switched terminals that are specifically defined for the user account. View Only level accounts are allowed to display RPC-40L8A4 status screens, but are not allowed to invoke switching commands or configuration commands. DUO is a cloud based two factor authentication (2FA) service that corroborates the identity of each logon to ensure that users are actually who they claim to be. When a user enters an account name and password to logon to the RPC, DUO then re-authenticates the user’s identity via mobile phone or other device. This effectively shifts access protection from a perimeter based approach that relies on the privacy of the user’s logon credentials, to an application based security solution that requires additional interaction from the user before access is granted. In order to help simplify configuration and setup of SSL communication, RPC Series Products now support Subject Alternative Names (SAN). SAN is an extension to SSL X.509, that allows a selection of additional host names (DNS names, IP Addresses, Email Address and URIs,) to be protected by a single SSL Certificate. Subject Alternative Names allow you to perform virtual hosting of multiple SSL sites on a single IP address and eliminate the hassles involved in configuring multiple IP addresses on your server. Zero-Touch Provisioning (ZTP) simplifies day 0 onboarding of RPC units and in many cases, eliminates the need to have an engineer present during initial set up. If configuration information is not detected during boot up, Zero-Touch Provisioning will be activated and the device will contact a DHCP server and then download a configuration script and perform a firmware update without user intervention. This drastically reduces service interruptions due to human error and cuts the time required to set up newly installed RPC Series products. The RPC-40L8A4 is built in the USA and backed by a five year warranty. WTI products are installed in thousands of network sites world wide. Our customers know they can depend on WTI for superior quality and reliability for their most mission-critical operations. All WTI DC Power Switch products include WTI’s convenient Enterprise Management Software, which drastically simplifies the task of managing multiple DC Power Switches spread throughout your network infrastructure. The WMU Enterprise Management Software provides a centralized command interface that allows administrators to easily manage, label and control multiple WTI DC Power Switches in large network applications, reducing the time required to access DC power reboot and DC power switching functions on connected devices. Once installed on your PC or laptop, the Enterprise Management Software can search a user-defined IP address range on your network and discover all compatible WTI devices within the range. Discovered devices are then added to the Enterprise Management Software’s inventory, allowing administrators to assign a descriptive tag to each DC Power Switch in order to denote the location or function of the device. In addition to providing a centralized interface for invoking DC power reboot and switching functions, the Enterprise Management Software can also be used to control firmware updates for WTI products and edit and manage user accounts at individual or multiple WTI devices. DC Inputs: (2) Bus A & Bus B, 40 Amps Maximum per Bus. 80 Amps Total.